Hot on the heels of our recent updates for Wes Craven and John Carpenter films we bring you news on another legendary horror Director: Tobe Hooper. 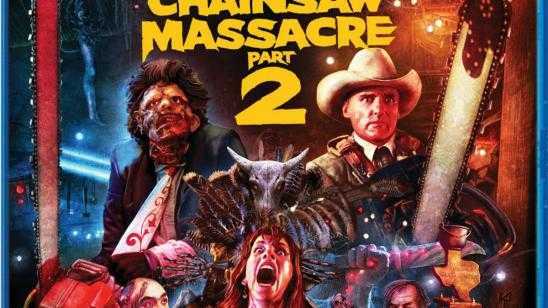 His wild, gory and truly off-the-wall sequel THE TEXAS CHAINSAW MASSACRE 2 will be landing on a 2-Disc Blu-ray "Collector’s Edition" on April 19th. New extras are still in progress and will be announced in full at a later date. With this official street date also comes the reveal of our newly-designed key art which was illustrated by the very talented Joel Robinson (Nightbreed, The Serpent and the Rainbow, Ginger Snaps). If you order directly through at https://www.shoutfactory.com/film/film-horror/the-texas-chainsaw-massacre-2-collector-s-editionyou’ll also receive this on a FREE limited-edition 18" x 24" poster with purchase and while supplies last. 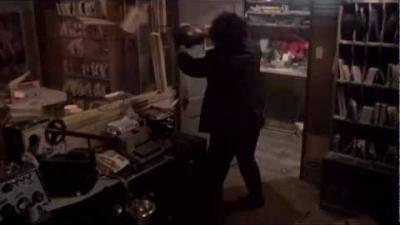 Official Synopsis: Radio DJ Vanita 'Stretch' Brock's open request night is plagued by the annoying phone pranking of two road tripping, party-hard, hoodlums, but things take a disturbing turn when the hoodlums meet their demise at the hands of familiar chainsaw wielding maniacs. With the entire gruesome ordeal recorded on tape, Stretch seeks out the help of a former Texas Marshall who's on a personal quest of vengeance against this family of cannibals. While at first he turns her down, he eventually decides to use her tape to his advantage, asking her to air it during her request block- effectively baiting the cannibals to the radio station where he'll personally deal with them.